Previously, I was wearing "detachable dress" provided from Front Row Shop, an online shopping which I trust in its high-quality fabric and trendy selections. However, this time can be a bit different because of what I am wearing right now. As you may know that I'm not a fan of buying high-end brands or anything costly yet poor quality, I think it is a great opportunity for me to introduce you guys about the "combination of outfit" including both brand's items and vintage one. Online Shopping Store. I featured Front Row Shop product on my blog a month ago. So, this is the second time to collaborate with my favourite online shopping store. I don't really purchase any white clothes due to how they can easily stained, as well as, I rarely put any white pieces on. Despite an unfamiliar feelings toward this Bralet Top, I still love the silhouette of deep v neck line, and cropped cut pattern. 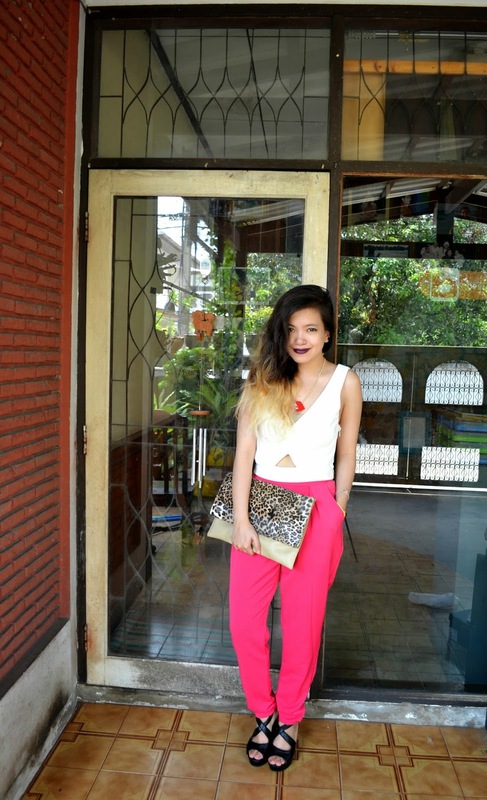 I love wearing crop top, therefore this item is totally welcomed to my streetstyle wardrobes. Vintage Shop. If you still recognize the vibrant pants which I paired with Paul's Boutique's Jessy Bag a while ago, yeah this pinky pants are the one I got from a vintage shop under the price of only £2! Actually, I got this pants so randomly because it happened like a flash of illumination. While I was wandering around Siam Square, a popular street market place located in the heart of Bangkok, Thailand, I noticed a vintage shop which were hanging wide variety of pants in different colours such as black, white, navy, lilac, pink, pastel green and etc. Well, I didn't even hesitate to stop at that shop, especially what tempted me the most was the big board written with the words "SALE" I know this is such a crazy logic of women with this temptation word lol I literally thought that at least I had to buy something! How can you just walk away without any arousing moments when everything in the shop's only £2 Are you crazy!!!? Brand Name Shoes. From the bottom of my sincere heart, I gotta admit that I got this Jeffrey Campbell's heels when they were on sale...lol However, it wasn't that pleasant though because this JC shoes bit my toes so hard that I don't really feel comfortable to put it on my feet for long. It is ok for the photo shoot but I would rather keep them in a box. I have a few pairs purchased from this brand but personally I do not quite fascinated because they are quite heavy and uncomfy. Some of you possibly love them or even list as wish lists of the month, but for me it is going to be occasional events only. Street Market. 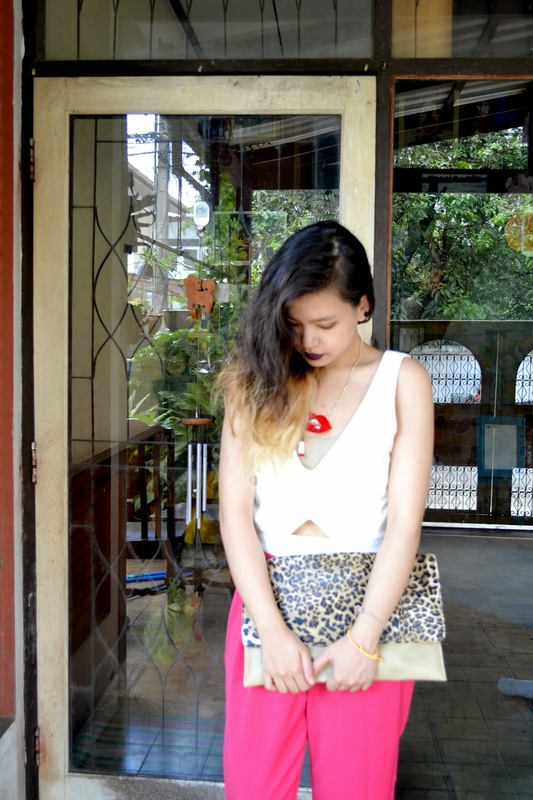 I am obsessed with leopard and zebra prints, and this clutch is one of the favourable items in my shelves. I got this clutch while I was walking at the street market in Singapore a few years ago. This is why I LOVE backpacking!!!! Really love the colour of those pants, Gail:) And those JC shoes are rad...too bad they're not that comfy. Those trousers are an amazing colour, and they go so well with the white crop top! Shame that the JC's aren't too comfy! I just got myself some fushia pants like that ! They look gorgeous, I love how you styled them ! that color is stunning. such a flashy and cool look! Heartbeats for your clutch Miss! Beautiful look! love your clutch!! Awesome look - You look great, absolutely love your lip colour! you know that pink is one of my favourit color and love so much your pants! Love the combination of bright pink and leopard, it's so fresh and fun! LOVING the color of those pants! And that Clutch is brilliant!! Fantastic outfit! I love those vibrant pink pants on you and I adore that clutch that you picked up in Singapore (now I am more determined to do some street shopping because I'm ashamed to say I haven't yet)! Amazing! I think I've never see you before with a trourser like that, but I love so so much this outfit! So cool! You always know how to style everything PERFECTLY. I adore those pants! I love pink and you look adorable in your pink pants! I love this!! nice how you paired the cropped top with the loose pants. love your lips necklace too! wow you look spectacular ! You really suit black lipstick & i love your pink pants! I love the color combination, such a cool look. You look so joyful with all those colors!